1. 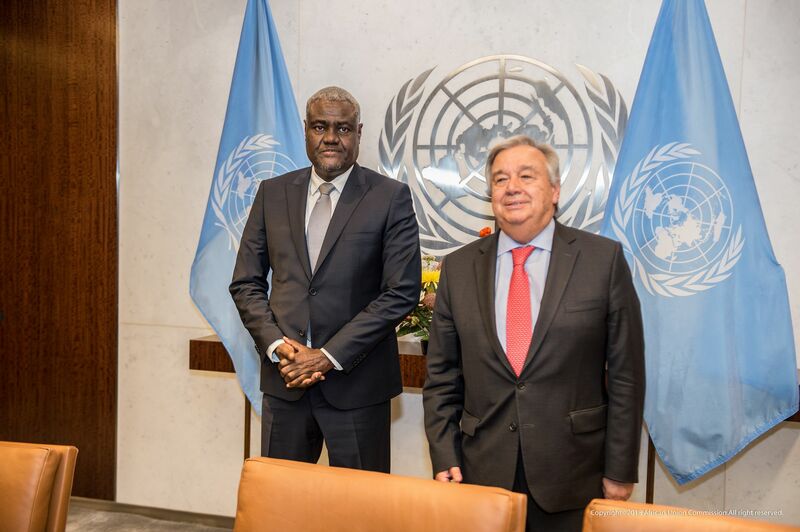 The Chairperson of the African Union Commission, Moussa Faki Mahamat, and the Secretary-General of the United Nations, António Guterres, met today in New York in the margins of the seventy-third session of the United Nations General Assembly. 2. They discussed issues central to the strategic partnership between the African Union and the United Nations, in line with the two joint frameworks they signed in 2017 and 2018 on peace, security and development. 3. They renewed their commitment to work closely together to support an effective multilateral global system and to advance peace, sustainable development and human rights in Africa. 4. They exchanged views on the ongoing reforms in the African Union and United Nations, aimed at making the Organizations more effective and efficient. 5. The Secretary-General commended the African Union and its Member States for the highest level of contributions reached by the AU Peace Fund since its creation in 1993. In this regard, both leaders advocated for the urgent need to secure predictable and sustainable financing for African Union-led Peace Support Operations authorized by the Security Council. 6. The Secretary-General thanked the African Union and its Member States for the wide support to the Action for Peacekeeping Agenda, which calls for collective and strategic-level commitments to address the political and operational challenges facing peacekeeping today. 7. The two leaders stressed the priority of both Organisations to prevent violent extremism and terrorism and discussed the efforts of both Organisations to further strengthen capabilities to support more effective engagement in the prevention, management and resolution of conflicts, including through specialized mediation support. 8. They praised the leaders of the Horn of Africa countries for their leadership and commitment to advancing peace and reconciliation in the region, and renewed their offer to support their efforts as needed. They also welcomed the signing of the Revitalized Agreement on the Resolution of the Conflict in South Sudan and called upon all parties to work in good faith and demonstrate their commitment to fully and expeditiously implement it. 9. They discussed other situations, including in the Central African Republic, the Democratic Republic of the Congo, Libya, Mali and the Sahel. On the situation in the Central African Republic, they welcomed the progress made in the peace process and underlined the need to strengthen it within the framework of the African Initiative for Peace and Reconciliation. 10. On the Democratic Republic of the Congo, they took note of progress made by the Congolese Government in preparations for the holding of presidential and legislative elections on 23 December 2018. Given the importance of the stability of the Region as a whole, the two Organisations reaffirmed their commitment to support free and fair and inclusive, peaceful and credible elections towards the end of 2018. 11. On Libya, they extensively discussed the worrying prevailing situation on the ground. They agreed to work in close cooperation with the Libyan actors on the principle of the organization of a peace and reconciliation conference as a prelude to the conduct of peaceful and transparent legislative and presidential elections. 12. On Mali and the Sahel, they discussed the growing insecurity in the region and agreed on the need to ensure complementarity of efforts by the two Organizations. They welcomed the efforts of the UN System in better addressing the humanitarian-development-peace nexus through the recalibration of the UN Integrated Strategy for the Sahel, the international framework guiding the international response, as well as the UN Support Plan aimed at boosting its implementation and fostering greater impact. They encouraged further cooperation and alignment between the AU and the UN strategies in the Sahel. 13. The two leaders highlighted the importance of implementing the two pivotal intergovernmental agreements, the 2030 Agenda for Sustainable Development and Agenda 2063: The Africa We Want. In this context, they stressed the importance of empowering women and youth as agents of change and custodians of peace in Africa, and encouraged more integrated approaches, encompassing security, humanitarian assistance, climate action, human rights, and sustainable development to address the root causes of conflict. They noted that the joint AU-UN visit to Chad, Niger and South Sudan had enabled the advancement of the Women, Peace and Security agenda. They also exchanged views on the preparations for the Climate Summit to be held in New York in 2019.